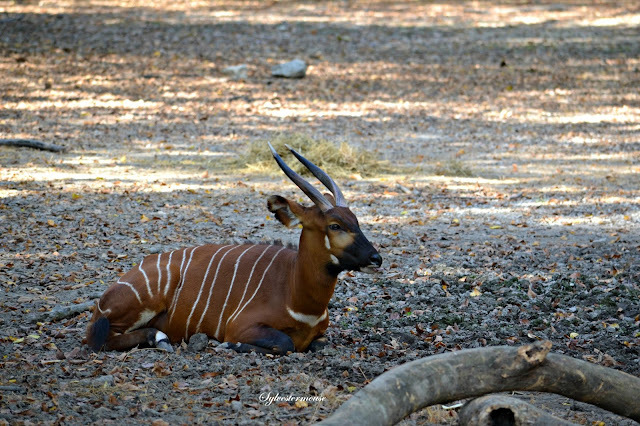 The Bongo is one of the largest antelopes in the dense African forest. They have been called "shy", but I believe they simply exhibit an extremely acute survivalist instinct. They run for cover immediately when they sense danger or any other animal around. When spotted, they are easy to identify by their size, as well as their deep chestnut coloring with long white stripes that extend from side to side across their back. In the photos, you will also note that they have distinctive white marks along the side of their face, on their ears and neck. Their legs also have dashes of white markings. The alternating white and reddish brown coloring make an excellent camouflage in the rainforest. Take a moment to really look at the Bongo. They are really quite beautiful! This Bongo was kind enough to show off her white markings! Note the white lines on the side of her face, on her ears, and on her neck. Weights up to 485 lbs. Their lyre shaped horns are one of their most interesting features. As mentioned in the facts above, their horns are spiral shaped with one twist, which you can see in the introduction photo. 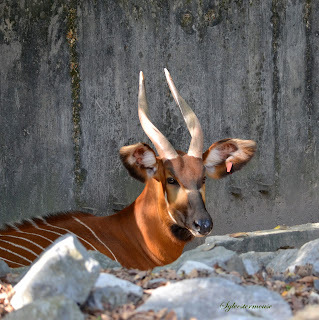 Bongos use their horns to pull and break branches for easier access to their desired food. They run with their heads thrown back so their horns are against their necks to keep from getting tangled in the surrounding vegetation. Not only must they fear carnivores in their natural habitat, they are also hunted for their meat. Sadly, big game hunters will also track and kill these beautiful antelopes. All of these factors contribute to their "near threatened" status. I always learn something new everyday and today I learned that the Bongo isn't just a drum but also a very beautiful animal. Thanks for shedding some light on this magnificent creature. 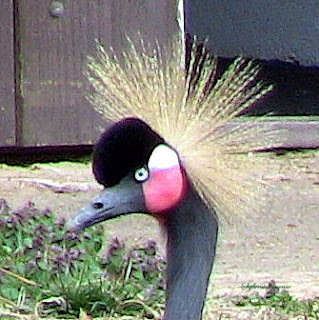 I've seen this animal before, but didn't know it's name. Bongo is beautiful! Thanks for introducing me to this wonderful animal.